Dinosaur Land (also known as Dinosaur Island on the remake's official site, and Dinosaur World in the cartoon), is a land inhabited by dinosaurs and the region in which Mario, Luigi and Princess Toadstool go on vacation in Super Mario World. The Denizens of Dinosaur Land. Yoshis appear quite frequently in Dinosaur Land, especially in Yoshi's Island. Despite its name, it only has a few other dinosaur species. These dinosaur species are Blargg, Dino-Rhino, Dino-Torch, Eerie, Rex, and Reznor. All are rarely encountered; Dino-Rhino and Dino-Torch are only found on Chocolate Island, Eeries are only found in Ghost Houses, Blarggs only appear in three levels, and Reznor only appear as boss characters. Most of the inhabitants are Koopa Troopas, Piranha Plants, and other staple Mario enemies. In Super Mario World, Dinosaur Land is more or less devoid of culture and even people, although it is known to be at least partially populated by Yoshis (who are known to be able to speak, but have not yet developed a distinctive, established culture). Later, in the Yoshi series (which presumably takes place on Dinosaur Land, although the actual setting is unconfirmed), Dinosaur Land is shown to have more intelligible inhabitants (the Yoshis on at least Yoshi's Island) who built tree-like huts and live together in villages. These games, which give Dinosaur Land much more culture and limited politics, showed that most of the Yoshis trust in the main Green Yoshi and have great togetherness, being able to always depend on each other for help. The Super Mario World television series is one of the earliest forms of media to show an inhabited Dinosaur Land (though here known as Dinosaur World) in-depth, and it reveals that the world is inhabited by cavepeople (though Yoshi himself is the only Yoshi to ever appear in the show). These cavepeople are seen to have limited togetherness and intelligence, and have even built at least one city; they are, however, rather stupid and seem to care little about culture and organization. Because of this, several Super Mario World show episodes deal with Mario and Luigi attempting to popularize modern items among the cavepeople and help them in vaguely political things, although their plans most often go wrong. One of the most interesting and one of the few successful of their capers, though, involve Princess Toadstool opening up a school; this episode even reveals that Dinosaur Land has a flag (a red, yellow, and blue one depicting what appears to be a Yoshi) and a pledge to it. This pledge, which largely parodies the United States of America' Pledge of Allegiance, goes like this: "I pledge allegiance to the flag of the United Lands of Dinosaur World, and to the repulsiveness for which he stands: one Koopa underground, reprehensible, with lizards and Goombas for all." It is likely that the second half of this pledge, which is awkwardly stated by Hip and Hop Koopa, is the Koopas' answer to the pledge, though, as it deals with the Koopa Troop and evil in addition to the fact that the other students give Lemmy and Iggy odd looks as they say it, although this can also be due to the fact that the two Koopa enemies have merely just arrived at their school. 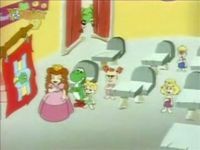 Princess Toadstool and her class pledge to Dinosaur Land's flag, as seen in the Super Mario World episode "A Little Learning". 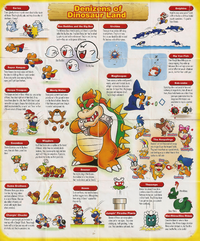 The Super Mario Adventures comic also gives Dinosaur Land a surprising quantity of politics and culture even at the age of the Super Mario World game; it introduces Yoshi Village (a Yoshi-inhabited village eerily similar to the one seen in Mario & Luigi: Partners in Time) and even states that Yoshi is the "Chairman of the Dinosaur Chamber of Commerce"; he presumably earned this title through election or another type of political gathering. A sign in the Nintendo Adventure Book Dinosaur Dilemma mentions a governor named B. Ron Tosaur. Finally, Dinohattan of the Super Mario Bros. film was inspired by Dinosaur Land, though takes more from the Mushroom Kingdom and Subcon. 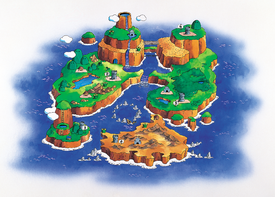 A labeled map of Dinosaur Land, as seen on a folded flyer included with Super Mario World: Super Mario Advance 2. In issue 4/1992 of the official German Club Nintendo magazine, it is noted that Dinosaur Land is located somewhere in the Pacific Ocean. "Fire Sale" • "The Wheel Thing" • "Send in the Clown" • "Ghosts 'R' Us" • "The Night Before Cave Christmas" • "King Scoopa Koopa" • "Born to Ride" • "Party Line" • "Gopher Bash" • "Rock TV" • "The Yoshi Shuffle" • "A Little Learning" • "Mama Luigi"
This page was last edited on April 11, 2019, at 00:30.